I'm seeing something weird this morning while editing questions (and answers). Instead of the normal monospaced font I usually see, the text is some smaller proportional font. Oddly, I'm seeing the correct font while typing this post but I've tried editing half a dozen different posts on SO and they all show the wrong font. Last night everything was fine. The font used to display the message is fine. It's only an issue inside the editing box. And it turns out that going back and editing this post, I am now seeing the same incorrect proportional font. Very weird. Why would I see the correct font when originally posting and the wrong font when I go back and edit? Did some CSS or something else change in the last 10 hours? I'm using Safari 11.0.1 on macOS 10.12.6 if it matters. 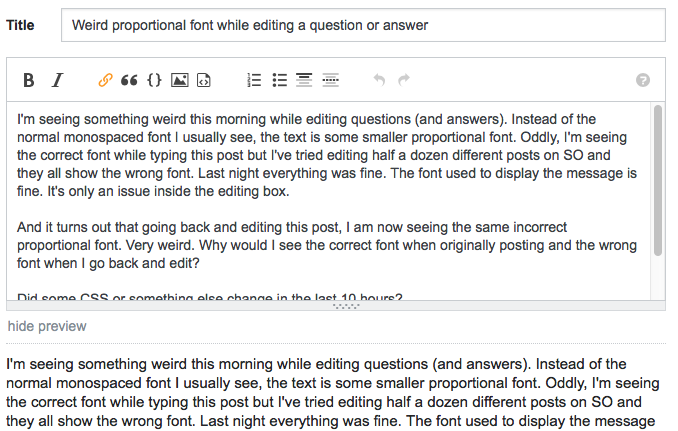 Fixed now, see Font in editor for editing posts has become proportional on MSE. Not the answer you're looking for? 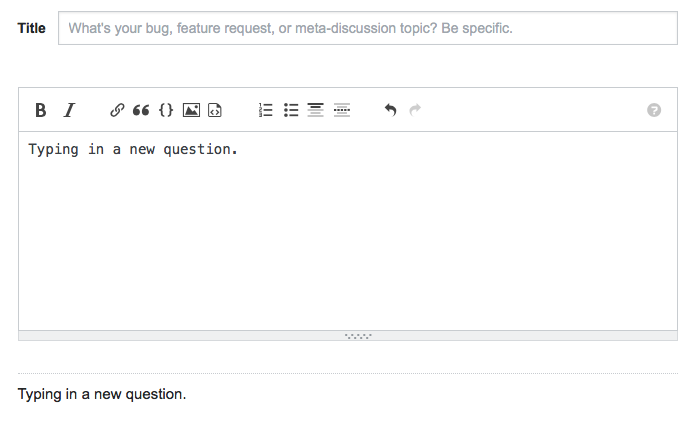 Browse other questions tagged bug status-completed edits design editor .